Recording of an individual’s progress, from Application and throughout their Employment. Only one entry is required for data and it can be simply enhanced from stage to stage. Holding of Complete Curriculum Vitae Data, such as Personal Information and Employment/Contract History. Recording of Courses Attended, Training Undertaken and Certificates/Qualifications gained. Separate area for special assignments. Tracking of Salary Appraisals, Reviews and Benefits (such as Health, Insurance and Pensions) provided to the employee. A wide range of Standard Reports with comprehensive search criteria. 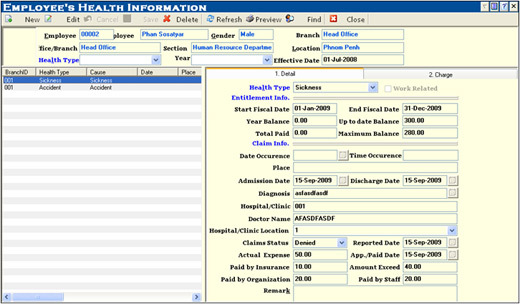 An integrated Payroll Module, which includes Cambodian Income Tax calculation functionality. An integrated Time and Attendance Module, which includes the ability to track employee using bar code, smart card, proximiter cards, or magnetic swipe card. Fully Customizable Field Names and Screen Layouts. Easily adaptable to Custom Requirements through the use of Microsoft development tools. Simple Import or Export of data from and to external systems. Data conversion – We facilitate the transfer of data from your old system to the new HRMS system, without any pain. Project management – We provide a project manager to be your first point of contact in the implementation of the new system. User training – The HDT offers a full training service, ensuring that all users are comfortable with all facets of the product. Help desk support – Just a phone call away and our experienced consultants will answer your query. Bespoke development – If necessary, the HDT can develop applications to suit a company with specialist needs. Annual maintenance – As part of our contract with you, HDT offers an annual maintenance service providing you with software upgrades and helpdesk support. Site reviews – We will carry out a “health checks” on the use of the HRMS system if required.